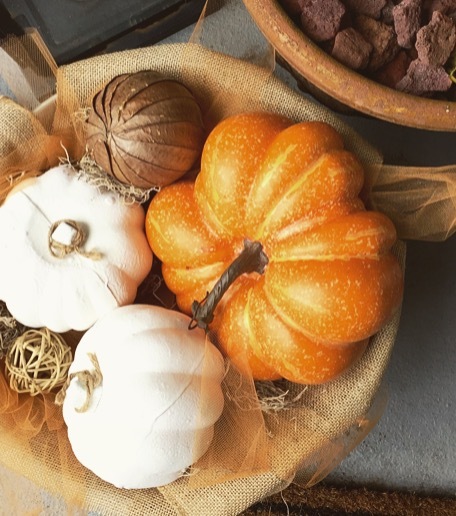 Decorating a "Fall" front porch in Florida is challenging to say the least. We can't use corn stalks, real pumpkins or even those cute hay bales you see all of the stores selling. Everything just becomes a wet, soggy, moisture filled mess! Even our mums don't last very long! This year I was determined (just like every year) to get my front entry looking "Fallish" and festive!! I finally got smart last year and started looking for some large faux pumpkins. I had one (orange pumpkin) stored in the garage that I purchased from Walmart last year and was on the lookout for more. I ended up finding two medium size "carvable" faux orange pumpkins at Dollar Tree and another medium size orange one at Walmart. The Dollar store pumpkins were a very bright orange fake looking color so I figured why not give them a makeover! I sprayed them down with my all time "go to" spray white primer Bulls Eye 123. (It's just so much easier then painting them) You could just paint your pumpkins with any white paint. I cut some twine and wrapped it around the little stems just to give it a more rustic touch. I filled up the bucket with plastic bags and layered a few pieces of burlap and orange tulle on top. 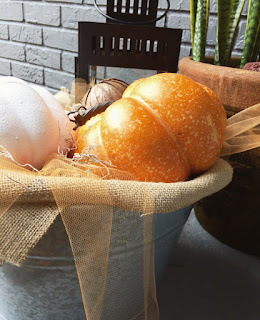 I placed my faux pumpkins inside and tada! I threw in a few stray pieces of my faux dried moss (Dollar Tree) just to give it some more texture! My porch isn't quite done yet but I'm trying to hold off on buying my mums till October! 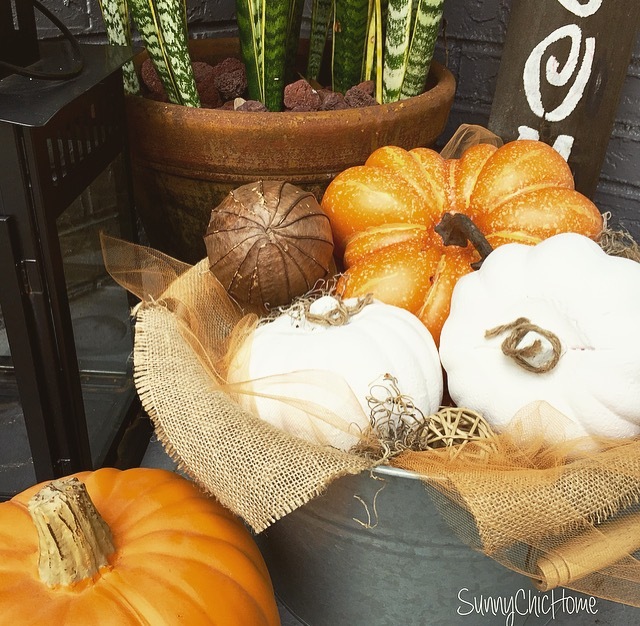 Until then I can enjoy my little bucket of pumpkins!